Before you start a charity, it is a good idea to do some research and develop a plan. Setting up and maintaining a charity, even a small one, requires a significant time commitment. You may wish to explore whether you can accomplish your goals by working with an existing organization. It is also important to make sure you have good management, recordkeeping, and accounting systems in place to start on the right track. The following information includes basic requirements for most charities beginning or maintaining operations in Oregon. There may be additional licensing, tax and reporting requirements. For example, you may wish to contact your city or county government to see if there are local licensing, registration or tax requirements. Decide on a legal form for the organization. Charities typically take the legal form of a nonprofit public benefit corporation, although some organizations are established as trusts or associations. Research, and consult with tax and legal professionals to decide what legal form is best for you. If you decide to incorporate your organization, the necessary forms are available from the Oregon Secretary of State’s Corporation Division website », or by calling 503-986-2200. Other types of nonprofits include religious and mutual benefit corporations. Religious corporations are typically formed by churches or other places of worship. Mutual benefit corporations are typically formed to benefit their members. They include social clubs or business leagues, in contrast to the broader charitable purposes of public benefit corporations. File Articles of Incorporation with the Oregon Secretary of State. This article assumes that you intend to form a nonprofit corporation because that is the most common way to start a charity. When you incorporate, you are establishing an entity that is legally separate from those who manage it. To benefit from the legal advantages of corporate status, your corporation must operate in accordance with the legal requirements of the Oregon Nonprofit Corporations Act. The Act can be found in Chapter 65 of the Oregon Revised Statutes ». To incorporate as a charity, you must file articles of incorporation for a nonprofit public benefit corporation with the Corporation Division of the Oregon Secretary of State ». You will be asked whether your organization will have “members.” This term has a specific meaning under Oregon law. When used in this context, the term “members” refers to people who have a right to vote on certain matters relating to the charities’ operation, in addition to the board of directors. Unless you intend to allow people other than directors to vote on certain issues, you should choose to be a “nonmember” corporation. Most nonprofit public benefit corporations also intend to apply for IRS 501(c)(3) charitable tax-exempt status ». In that case, your organization’s articles of incorporation must include a clause that the corporation’s assets will be distributed to another IRS 501(c)(3) charity upon dissolution. Apply for tax exempt status with the IRS. Most charities apply for IRS 501(c)(3) status », which means that the charities’ income is tax-exempt and they are also eligible to receive tax-deductible donations. Please note that nonprofit corporations are not automatically tax exempt. Before you submit your organization’s application, you will need to obtain an Employer Identification Number (EIN) from the IRS ». Consult with a tax or legal advisor about obtaining tax-exempt status. Currently, the IRS application fee is a minimum of $275 if the organization is small enough to file the 1023EZ application. The fee is greater if the organization is required to file the longer 1023 form. For more information, visit the IRS website » or call them toll-free at 1-877-829-5500. Register with the Oregon DOJ. Generally, nonprofit public benefit corporations or associations or trusts with a charitable purpose must register with the Charitable Activities Section of the Oregon DOJ. Registration is required because the Attorney General has oversight authority to protect the public’s interest in charitable organizations and their assets. Read more about registering your charity, download registration forms or call us at 971-673-1880. File annual reports with the Oregon Secretary of State. To maintain the legal status of your nonprofit corporation, you must submit a report to the Oregon Secretary of State’s Corporation Division » each year. It is due on the anniversary of the filing of the articles of incorporation. The Corporation Division will notify you when it is time to renew, but it is your responsibility to keep track of corporate filing requirements. If the organization’s contact information has changed, you may not receive the renewal notification, so be sure your contact information is current with the Secretary of State. If your corporation’s annual report is not filed in a timely manner, it will be administratively dissolved by the Secretary of State. It is generally possible to reinstate a corporation after it has been administratively dissolved, but your organization may owe additional fees. You may also need to file other documents with the Secretary of State, such as changes to your corporation’s registered agent or amended articles of incorporation. Direct questions regarding annual reports to the Corporation Division », or call them at 503-986-2200. File informational tax returns with the IRS. Most organizations with tax exempt status under IRS Code 501(c)(3) or other 501(c) provisions need to file annual informational tax returns. Consult IRS instructions » to determine if Form 990, 990EZ, 990PF (for private foundations and trusts), or 990N (for smaller organizations) is right for you. Organizations with employees and/or unrelated business income may need to file additional returns. Consult the IRS for more information on deadlines, penalties and other requirements ». File annual financial reports with the Oregon DOJ. All organizations registered with the Oregon DOJ’s Charitable Activities Section must file annual financial reports unless otherwise exempt. Annual reports are due four months and fifteen days after the close of the organization’s fiscal year. 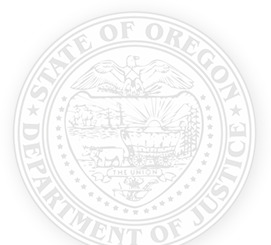 The Oregon DOJ may grant an extension of up to 180 days if requested on or before the due date. Payment of the report fee must be included with the report. The fee is on a sliding scale, and based on the organization’s assets and revenue. Read more about filing instructions, download annual report forms or call us at 971-673-1880. There are additional resources to help you manage your nonprofit organization. The Oregon DOJ is here to help. Please call us at 971-673-1880 with any questions or concerns.